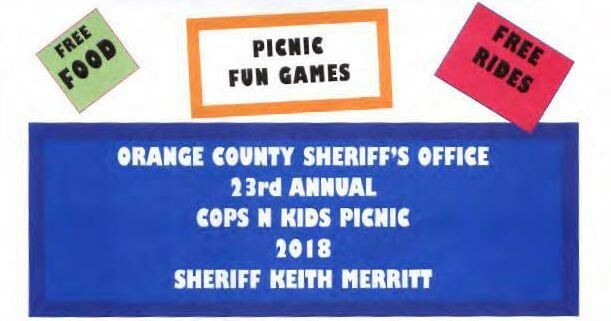 Come on out to Claiborne Park June 15, 2018 for the Orange County Sheriff's Office 23rd Annual Cops N Kids Picnic with Sheriff Keith Merritt. The Orange County Sheriff's Office invites ALL children to join us for free food, free rides, free games and the opportunity to meet and hang out with members of all area Emergency Services. There will be plenty of refreshments such as hot dogs, chips, drinks, and watermelons.